If their movie doesn’t float your boat as a work of science-fiction, action, philosophy, heliocentrism, or staggering visual spectacle (although, it really should), then it certainly succeeds as a parable for cinematic ambition. Why your mileage may vary: the final plot-twist (and the resulting final 20 minutes of the movie) is about as ludicrous as any movie I’ve seen. Why I loved it anyway: truly beautiful imagery (watching Mercury drift across the face of the sun? amazing! ), also I’m a sucker for science fiction. The movie’s biopic aspect is multiplied by the sheer number of players who made Chess the first family of Chicago blues, R&B and rock ‘n’ roll…That all of them were later inducted into the Rock and Roll Hall of Fame attests to their enormous influence on popular music and culture. Why your mileage may vary: the story is littered with omissions and half-truths and embellishments - three things all problematic for a biopic. Also, Beyonce isn’t a very good actress. Why I loved it anyway: I loved the music, much overdue exposure for three of the greatest and most influential musicians ever (Muddy Waters, Chuck Berry, Etta James). The Brothers Bloom has it all: charming romance, jaunty adventure story, witty dialogue, gorgeous cinematography and superb performances. Why your mileage my vary: the ending rambles a bit and there are, perhaps, one (or two) too many twists. Why I loved it anyway: Rachel Weisz. Someone like Petey Greene made a difference and made a mark, and broadcasting is better because of his transparent honesty. He helped transform African-American stations more, probably, than their mostly white owners desired. And talk talents like Howard Stern, whether they know who he was, owe him something. Why your mileage may vary: it’s a simplified biopic about a pretty obscure radio personality. Why I loved it anyway: Don Cheadle, Chiwetel Ejiofor, and Taraji P. Henson are stellar (as usual for all three). Tailor-made for maximum inspirational, historical and educational impact, The Great Debaters shines a bright spotlight on a remarkable example of black achievement long forgotten in the sorry history of the Jim Crow South. Why your mileage may vary: it’s often cliche and deviates significantly at the end from the true story on which it’s based. Why I loved it anyway: Jurnee Smollett is incredible, Denzel Washington and Forest Whittaker are a powerful presence. I don’t think it’s possible to watch this movie without your throat lumping up. If the film is too similar to Ritchie’s first movie, “Lock, Stock and Two Smoking Barrels” with its multiple story lines, complex plotting, and double-crossing antics, it’s at least colorfully told with dialogue that shines with the inventive slang of Ritchie’s screenplay. Why your mileage may vary: you’ll probably need subtitles to follow the (English) dialog. Why I loved it anyway: it’s my favorite of the British cockney gangster flicks and Brad Pitt’s performance is at least as enjoyable as in Fight Club. This is a Ferrell you’ve never seen before, nailing a role that calls for breakneck humor in the final race against the clock and touching gravity in the love scenes with Gyllenhaal. Why your mileage may vary: you might be expecting a Will Ferrell movie and find yourself disappointed. Why I loved it anyway: this is easily and by far my favorite Will Ferrell movie. Also, Emma Thompson is a great, great actress. The innate suspense and charm of the spelling bee, along with a trio of crack performances, turn what is in essence a formulaic sports picture into something more satisfying: an underdog tale that manages to inspire without being sappy. Why your mileage may vary: it’s a family-friendly Disney Channel ready feel-good movie. Why I loved it anyway: It’s feel-goodness really does feels good. Keke Palmer’s performance outshines those of Laurence Fishburne and Angela Bassett - that’s saying alot. Meticulous and detailed, a drug-world epic that holds you from moment to moment, immersing you in the intricate and sleazy logistics of crime. Yet the movie isn’t quite enthralling; it’s more like the ghost version of a ’70s classic. Why your mileage may vary: this movie is lengthy and if the drama of the drug trade isn’t your thing, you’ll be watching the clock in pretty short order. Also, RZA probably shouldn’t be acting. 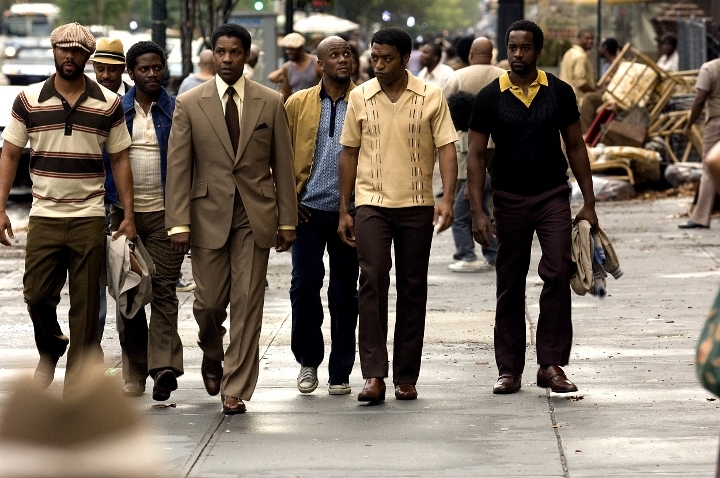 Why I loved it anyway: watching Frank Lucas as portrayed by Denzel Washington exert a stranglehold on the streets of Harlem and then watching it all fall apart is interesting from beginning to end. Portman doesn’t catch fire until the second half, then heaves herself into emotional action; this suits her initially passive, mostly unthinking character. Weaving, who acts entirely with his voice, is V’s ideal embodiment: witty, rueful, pitiless, visionary and mad. Why your mileage may vary: it’s on the long side and too philosophical for it’s own good. Why I loved it anyway: when Natalie Portman turns it on, her performance is enthralling. As Nash gets closer to Crowe’s own age (and level of dissipation), the performance settles down and becomes first credible and then overwhelming. This is a stupendous piece of acting. Why your mileage may vary: the plot and pacing jumps around a lot and the idea that you can conquer serious mental illness with the love of a good woman might end up feeling ridiculous. Why I loved it anyway: great performances from open to close, especially from Russell Crowe and Jennifer Connelly, the leads. Also, it’s fascinating for me to watch a biopic about someone I’ve actually met. If you’re a novice, this is a plucky introduction to Whedon’s world and the most fun sci-fi of the year. If you’re a devotee, this is the magnificent return you’ve been praying for. Why your mileage may vary: if you haven’t watched the television series Firefly, you’ll be disoriented for the first half of the movie and you’ll lack the connection to the characters necessary to really appreciate the second half of the movie. Why I loved it anyway: I watched and loved every episode of Firefly; I know and love every one of these characters. There’s no denying the film’s power of compulsion and the sense that, when it’s all over, it means something. Most viewers will be entertained and moved, and some will find their intellect aroused. Why your mileage may vary: it’s a really long movie and it basically rehashes the Forrest Gump story. Why I loved it anyway: the visual effects are ground breaking and game changing - so much so that you never realize you are watching an effect. Unnervingly good, Little Children is one of the rare American films about adultery that feels right — dangerous, hushed, immediate. Why your mileage may vary: Again, a rehash - this time of American Beauty. Why I loved it anyway: I saw it as honest and believable and more of a complement to American Beauty than a rehash. The film rests on Depp’s evocation of Barrie’s gentle, playfulness and deeply buried sorrows; it’s difficult to imagine another actor so gracefully evoking Barrie’s childlike qualities without seeming creepy or emotionally malformed, and only the hard of heart will come away dry-eyed. Why your mileage may vary: it’s sappy and glossed over. Why I loved it anyway: I think it’s more touching than sappy, and Kate Winslet’s performance is moving.